With new editing and recording functions, expanded AV/IT connectivity and optional AVCHD support, the new AJ-HPM200E P2 HD Mobile field is the most versatile 10-bit, independent frame, 4:2:2 quality HD field recorder and can be used with virtually any camera. 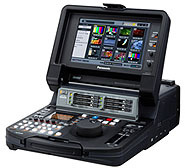 The Panasonic HPM200E offers all of the popular features found in its predecessor, the AJ-HPM110, and adds new functionality including: enhanced cuts editing with separate source and record windows, full-frame rate playback from external disk drives, AVCHD compatibility (with the AJ-YCX250G option card), up-conversion of live video inputs in real time, e-Sata and Giga-bit Ethernet interfaces for expanded network connectivity and 24p Time Code input for production applications, including use as a source for a traditional dailies process. The HPM200's ability to record in master-quality AVC-Intra (100/50) as well as DVCPRO HD/50/25 and DV gives it the flexibility to be used at the center of any production, from tape-based digital cameras to high-end cinema cameras with 1080/24PsF output. And now with optional AVCHD compatibility, the HPM200 gives professionals a simple, easy-to-use solution for managing HD content for distribution, storage and playback using SD memory cards. Professionals can play AVCHD files directly from an SD card using the unit's SD slot, convert P2 content to AVCHD for low bit rate distribution over a network, convert AVCHD to P2 to edit in a P2 project, and record P2 and AVCHD simultaneously for backup or distribution (perfect for dailies). New e-Sata and Giga Ethernet interfaces allows users to playback and edit content directly from hard disk drives and share files across FTP networks faster, whether working with high resolution P2 or lower-bit rate AVCHD. Additional features added include: up conversion of live video inputs in real time, full frame rate playback from external disks, 24p Time Code input for production applications, including use as a source for a traditional dailies process. The versatile HPM200 is ideal for a wide range of applications including broadcast (transitioning ENG users to HD field production), sports trucks, live events, studio and post production, and more. 64 GB Card Approx. 64 min. 32 GB Card Approx. 32 min. 16 GB Card Approx. 16 min. 64 GB Card Approx. 384 min. 32 GB Card Approx. 192 min. 16 GB Card Approx. 96 min. 64 GB Card Approx. 128 min. 32 GB Card Approx. 64 min. 16 GB Card Approx. 32 min. 64 GB Card Approx. 768 min. 32 GB Card Approx. 384 min. 16 GB Card Approx. 192 min. 64 GB Card Approx. 256 min. 32 GB Card Approx. 128 min. 16 GB Card Approx. 64 min. 64 GB Card Approx. 1,536 min. 32 GB Card Approx. 768 min. 16 GB Card Approx. 384 min.